So Wednesday at the gym was leg day. One of the movements I always try to do during leg day are squats. I don’t particularly enjoy doing squats. My body is not exactly well proportioned to squat effectively. I also don’t have much meat on my back so resting the bar back there is not very comfortable at all. I have squatted for years off and on but up until a couple years ago I was one of those half squatters. A half squatter is a guy that doesn’t go down very far, nowhere close to ideal thigh position of parallel to the floor (or even lower). I have half squatted as much as 275 pounds. Well thanks to extensive encouragement by Jeremy I have made a conscious effort to squat regularly for awhile now as well as squat correctly. After all it is one of the best total body movements out there. So anyway, on Wednesday I topped out at two reps at 225 pounds, trying to make sure I went adequately deep. On the second rep I almost stalled out but I managed to barely keep the bar moving. Well yesterday my right hip was hurting quite a bit. The pain increased steadily throughout the day to the point where I had a noticeable limp. Surely the pain is related to those squat reps. I used the pain as a motivator to pull the trigger on buying another roller. The one we had went with my wife when she moved out. A roller is a really good preventative maintenance tool. Rolling across it with various body parts offers similar benefits to a sports massage. I went with a roller that looked very similar to what my brother Patrick has. Instead of being solid foam, which can compress over time, this model has a hollow plastic core with ribbed foam around it. Pat has had his roller for two years and uses it regularly. 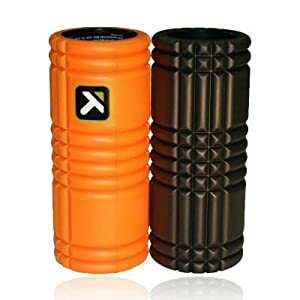 One thing a roller like this can really help with is tight IT bands, something I definitely suffer from. I am hoping with consistent use I can make painful hip episodes like this a less frequent occurrence.